With the holiday season coming to a close, I decided to hit the anime image boards for some inspiring new art for my January background. What I saw ended up making me think. See that image above? 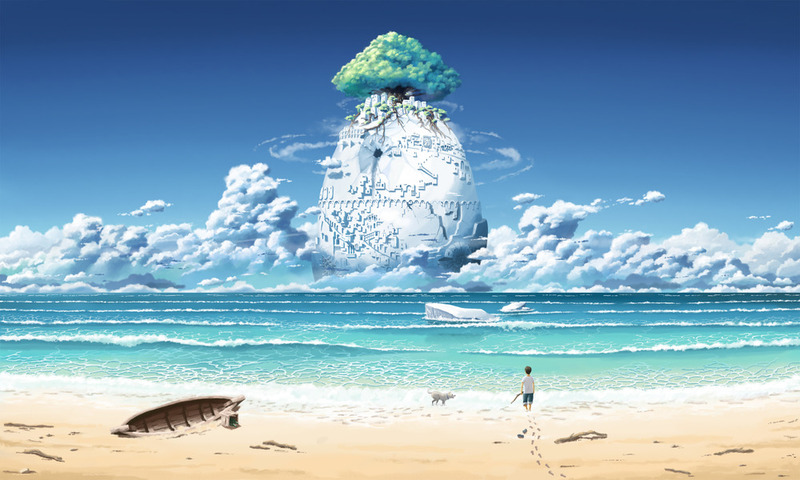 Drawn by Inoki-08 and uploaded to Pixiv, it depicts an ocean scene with what appears to a dog playing with his owner. In front of them in the distance, we see a monstrously huge, egg shaped boulder with intricate carvings on its surface. How did they come up with that? Or more pressing for me personally, how did they translate that abstract concept in their head into something concrete? How did they draw that? As many of my fellow IT women and men do, I design software, write code and maintain systems with admittedly cryptic commands; most of which probably look like gibberish to most people. I've gradually tried to convince myself over the years that this is how I'm "creative". And yet, seeing this image… it's humbling. Had I spent hundreds of hours in front of a paint brush, or a graphics tablet, I could have never drawn something like this. Or mascots. Or calligraphy. Even if I possessed sufficient skill, I doubt I could have come up with something so fantastic. I've been using the term "humbling" a lot over the last year. I guess a sign of getting older is the gradual appreciation of just how much is really out there. At the risk of ending on a cliché, the more we learn, the more we realise how little we know. Oh yeah, and artists will forever intimidate me.